The concept of the cadential 6 4 (pronounced ‘six-four’) often seems overly theoretical and perhaps a little confusing for students of harmony. Theorists and authors explain it in different ways so in this lesson, we’re going to see what it’s all about. What is the cadential 6 4 chord? The cadential 6 4 is a melodic and harmonic formula that often appears at the end of phrases in music of the common practice period. Typically, it consists of a decoration of the dominant chord by displacing both its third and fifth by a step above. Before we discuss the cadential six-four any further and listen to some examples, let’s look at a basic one so we’re sure to be on the same page. On the left of this picture we have the dominant chord (V) of C: G major. On the right is the cadential six four applied to the same chord – observe how the third and fifth of the dominant (notes B and D) are moved from the strong beat unto a weaker beat by notes a step above them. The idea behind the cadential six-four is to decorate the dominant chord. Since the completion of the dominant chord is slightly delayed, the result is a subtle harmonic tension and release. Why is it called a Cadential 6 4 – 5 3? Why 6 4 – 5 3? Do the same for the fifth of the chord: push it to a weaker beat through a note above it. Let’s follow these steps and write a cadential six-four in G major. Complete cadential 6 – 4 on the dominant of G major. And there we have it – a cadential six-four in G major! Think of it as a decoration of the dominant chord. Instead of the getting the full D major chord on the strong beat as we’d expect, we get it a little later as its 3rd and 5th are displaced by the notes above them. What’s pushing them to the weaker beat? Of course, it’s the notes coming from a step above! As we said before, the idea behind this formula is to delay slightly the completion of the dominant chord. This causes a subtle harmonic tension and release. The formula for a cadential six-four in a minor key is essentially the same. Just make sure that the third of the dominant chord is raised by a step (a semitone). The reason for this is that the raised third produces a better pull towards the tonic, which is essential in tonal music. Here are two examples: one in D minor and the other in C minor. 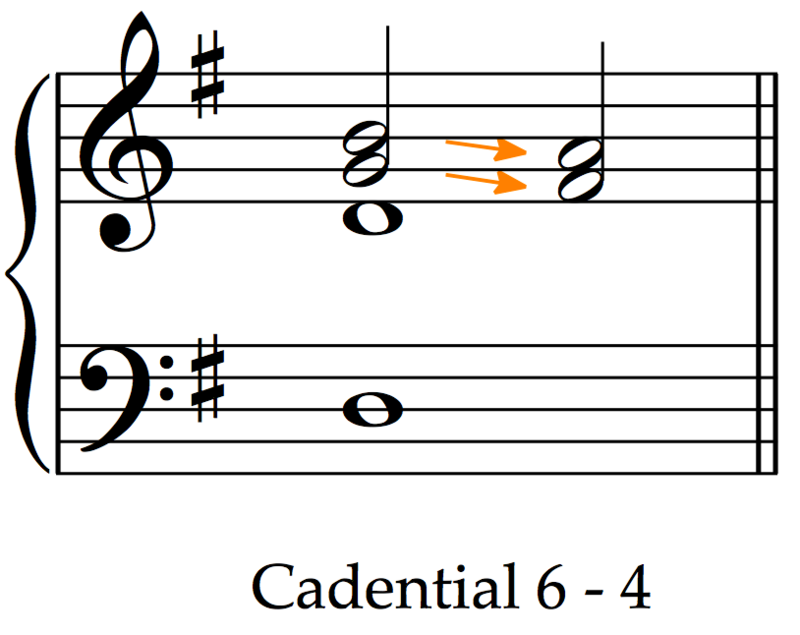 As you can see, the term ‘cadential six four’ (also known more fully as the ‘cadential six four – five three’) consists of two parts: the word ‘cadential’ followed by the numbers. ‘Cadential’ simply refers to the fact that this harmonic formula occurs at cadences, that is, the end of musical phrases. As for the numbers, these come down to us from the Baroque period, which lasted from the year 1600 to about 1750. Back then, they had a system known as figured bass in which the composer would simply write the bass notes with some numbers (figures) and the performer (usually a keyboard player) would interpret them and fill out the chords. Counting 6 up from E (and ending up on C). Once the notes E and C are understood, the performer would then fill out the chord as he sees fit. In this case, we have a C major chord in first inversion (that is, C major chord with the 3rd in the bass). 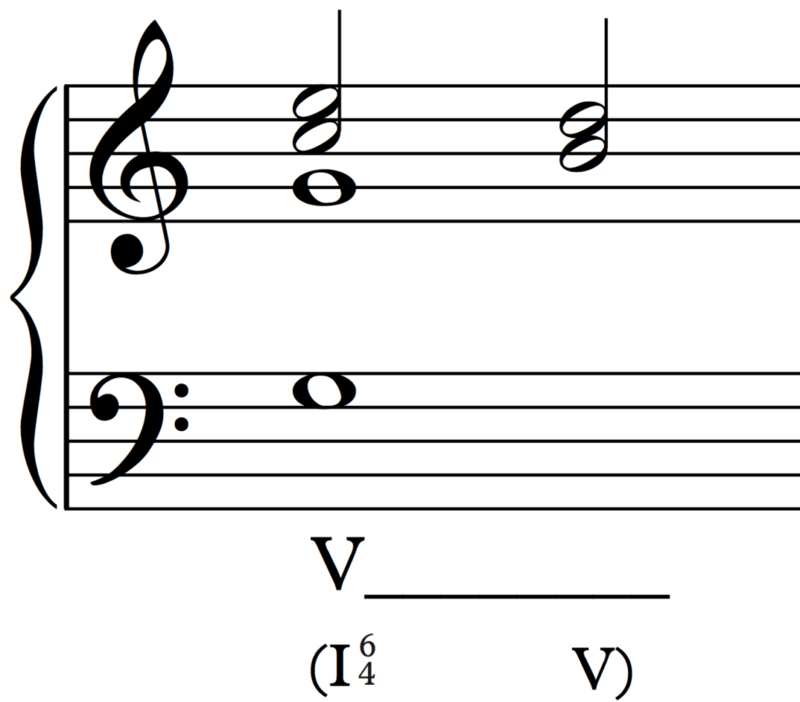 The figure 6, in fact, always implies a first inversion chord. While figuring out the chords in this way is a slow process at first, trained musicians back then could do it at first sight and even improvise on it! If the bass note is G and the figured bass with it is 6 4, we count in the same way. Six above G is the note E and four above G is the note C. So the chord is C – E – G in 2nd inversion (meaning that the 5th of the chord is the lowest note). 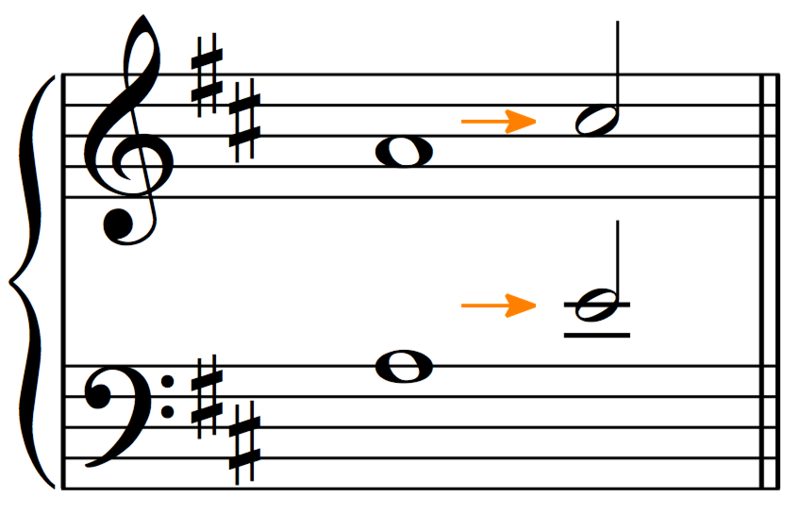 The figures 6 and 4 refer to the distances of the notes from the bass. These figures produce a chord in second inversion. The figures 5 and 3 also refer to the distances of the notes from the bass. These figures produce a chord in root position. In the cadential six-four, the six resolves on five and the four resolves on three. So how do we label the cadential six-four? At first glance this seems to be correct. After all, that first chord is a 2nd inversion tonic, right? Well, the issue with this is that it takes the chords out of context. It ignores the fact that although the cadential six-four is made up of 2 chords, it’s still one harmonic formula. That first chord doesn’t work on its own because it’s a decoration of the second one. This label almost ignores that subtle tension and release that is produced by delaying the completion of the dominant chord. Other authors suggest that the solution to this issue is to label both chords as V (meaning dominant) and just have ‘six-four’ on the 2nd inversion chord and ‘five-three’ on the root position chord. The issue with this option is that it can be misleading. V6-4 suggests that the dominant chord is in second inversion and clearly this is not the case. 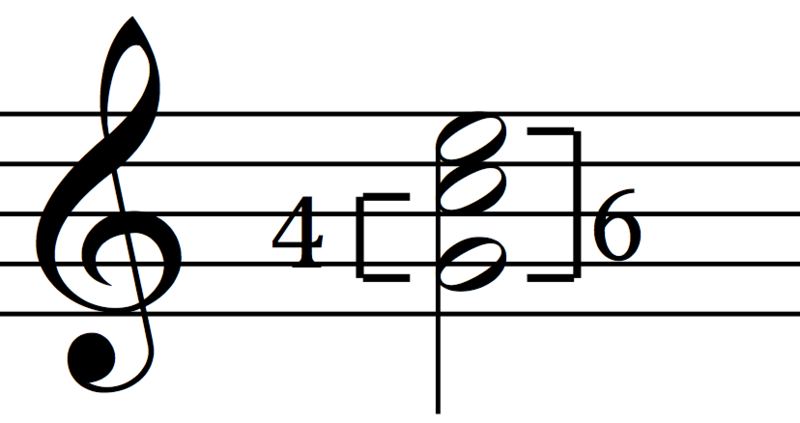 The dominant chord in the cadential six-four is in root position. So what are we to do? How should we label the cadential six-four? If you’re a student preparing for an exam, my advice is to follow the requirements for that exam. It’s not worth losing points over this. And if you’re a budding composer learning privately or by yourself, you can just pick one and stick to it. As long as you understand what the cadential six-four is, you’ll be fine. The way I personally label the cadential six-four is with a large V symbol all throughout and a I6-4 V5-3 in a smaller font underneath. This shows me immediately that the function of these chords is of the dominant but at the same time, it’s a cadential six-four. In a way it’s combining the other 2 common options. If you like this method, adopt it! To me, it’s the clearest labelling. Now that we got that out of the way, let’s look at some beautiful examples of the cadential six-four. Let’s begin with a couple of popular examples. Here is the cadential six-four in the introduction of Elton John’s ‘Goodbye Yellow Brick Road’. The key is F major. Next we have an example in D major from Elvis Presley’s ‘Can’t Help Falling in Love’. The cadential six-four was a popular harmonic formula in the common practice period. You’ll find many examples in the music by Haydn, Mozart, Beethoven and in the music that came after them. Here is an example from the 2nd movement of Beethoven’s first Piano Sonata. The formula is used twice but it’s slightly different the second time. As we said earlier, the formula works just the same in the minor keys. Here it is in E minor from Tchaikovsky’s ‘Children’s Songs’, Op. 54. Notice that the 7th degree of the scale (in this case, the note D) is sharpened. By far the most common cadential six-four formula is the one we’ve been discussing – the melodic decoration of the dominant chord. There is another cadential six-four chord that is not as popular. The pattern is the same except that instead of the dominant, it occurs on the tonic chord. An example should make it clear. In the next diagram below, we have a long tonic chord in C major. It’s in root position and on the strong beat. What if we decorated the chord like we did with the dominant before? We can displace the third and the fifth by a step up so that we complete the chord a little late (producing a little melodic decoration and a bit of tension and release). As the example shows, the result is a cadential six-four on the tonic with (what looks like) a 2nd inversion subdominant chord resolving on the tonic in root position. Resolution is by step down to complete the main chord with all its components: root, third and fifth. What are the other types of six-four chords? In this style of harmony (from what’s known as the common practice period), there are 4 main types of six-four chords. The cadential six-four is one of them. The others are the passing six-four, the neighboring six-four (also known as the auxiliary six-four) and the pedal six-four. How do I practice hearing and writing the cadential six-four? To practice writing, follow the formula we discussed in this lesson. Try many different keys (both major and minor) and come up with alternatives for the same chord. To practice hearing, play the examples as well as your exercises on a keyboard. With some time, you’ll learn to recognize the formula by ear.